The design of the Swan Lounge Chair was conceived by Arne Jacobsen – the legendary Finnish modernist and an iconic figure of 20th century architecture and design. The Swan Chair, manufactured by the Republic of Fritz Hansen furniture company, has been in constant production since its introduction in 1958. This timeless piece of furniture, despite its considerable age, still looks extravagant and intriguing, making it a great, tasteful addition to any modern interior. The Swan Chair was developed in 1958, along with the Egg Chair and the Drop Chair, in order to furnish the lobby of the Radisson Blu Royal Hotel in Copenhagen. The entire building, together with its interior and furnishings, was designed by Arne Jacobsen for the Scandinavian Airline System (SAS). While working on the project of the hotel, Jacobsen, who had worked as a landscape architect in the past, pursued a "modern garden" theme. It resulted in the organic, oval form of the chair, which matches the rest of the furnishings developed for the hotel. The first prototypes of the Egg and the Swan were built by Jacobsen in the garage of his home in Klampenborg, north of Copenhagen. The chair, enthusiastically received by the public and critics, was put into mass production. It is commercially available under the Republic of Fritz Hansen brand. This Danish manufacturer began its collaboration with Arne Jacobsen in 1934. 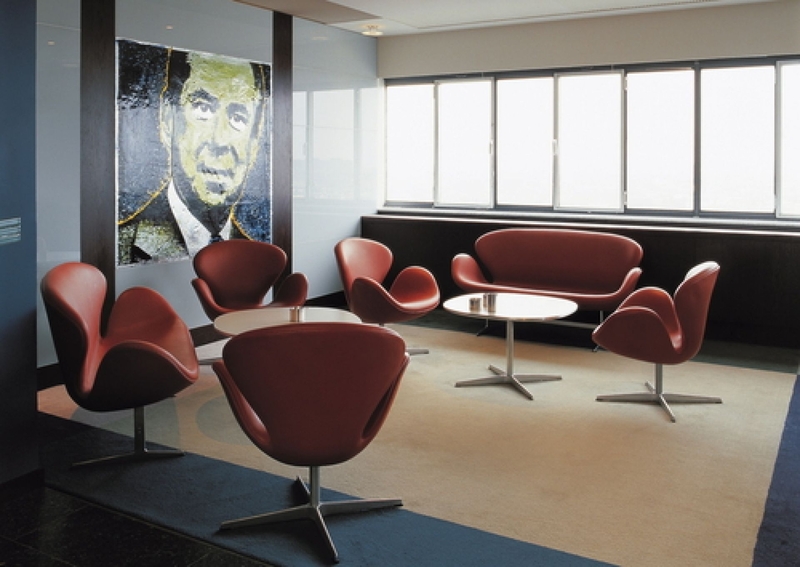 Since then, Jacobsen provided the company with many memorable furniture designs, including the following: the Ant Chair, the Series 7 Chair, the Grand Prix Chair, the Drop Chair and of course the iconic Swan and Egg Chairs. Although many people would certainly engage in polemics over the arguable appeal of the SAS Hotel tself, the design of the Swan Chair does not leave any room for such a discussion. Its cutting-edge futuristic design, combined with the impeccable quality of craftsmanship, has earned the chair a very special place in the history of interior design. Although the chair looks like a masterpiece of modern art, it is fully functional and very comfortable. Perhaps the most distinctive feature of the chair is its shell, which deprived of any straight lines. With its famous, soft curves, the chair resembles a swan when looked at from the side. Hence the chair’s name – “The Swan Chair”. The shell is manufactured from the glass fiber, which is molded into the desired shape. The shell curves around the person sitting in it, giving the chair its famous cozy, intimate feel. Its curvy arm rests and generous back rest give the chair its relaxing, lounge appeal. The high level of comfort can be attributed to the high-density, cold cured polyurethane foam, which is then covered in either supple, high-quality leather or fabric upholstery in a wide variety of colours. The chair is supported on a steel spindle and a rectangular steel plate, which is attached to the bottom of the shell with four Allen screws. The individual parts are welded and surface treated with matt zinc. The swivel assembly rests on a 4-star base in injection moulded aluminium. Additionally, the base is equipped with the synthetic material glides for the floor surface protection. The Swan Chair is available in two different heights, standard or +8 cm versions. The chair comes with a comprehensive five-year warranty against manufacturing defects. By registering your chair at the Republic of Fritz Hansen website, the guarantee is extended and comprises of a 5-year warranty covering the swivel mechanism, automatic return, fabric and leather (Basic Leather) defects as well as a 10-year warranty covering the base, shell and selection of premium leather upholsteries. The overall appearance of the chair is extraordinarily appealing and stylish. Even today, more than five decades after its presentation, when modernism is not an extravagant or radical concept anymore, the Swan Chair has neither aged nor become trite. It still looks fresh and contemporary. An ideal chair for lounge or waiting areas, as well as a tasteful addition to any modern house. The original interior of the SAS Royal Hotel in Copenhagen has been changed in order to match the standard design of the Radisson Blu hotels. Only a single room, with the number 606, has been kept in its initial form. It has all of the original furnishings, including the Swan Chair and the wood panels on the walls. The room is still available for booking. The Swan Chair can also be seen in several cinematic productions, including: Men In Black 3 and James Bond: Quantum of Solace.